VISIONS OF THE NORTH: The Boat Place(s)? Anyone with an interest in the Franklin expedition has read a great deal over the years about the "Boat Place" on King William Island. It's identified with the site where Hobson, McClintock's lieutenant, discovered an abandoned whaleboat from one of Franklin's ships, a boat which famously contained two skeletons, as well as an abundance of items, judged "a mere accumulation dead weight" by McClintock, which he catalogued at length: sheet lead, carpet slippers, waterproof canvas, tea, chocolate, a large array of silver utensils, and many books, Goldsmith's Vicar of Wakefield among them. The boat was also pointing in what seemed the wrong direction: not toward escape, but back toward the last known location of the ships. 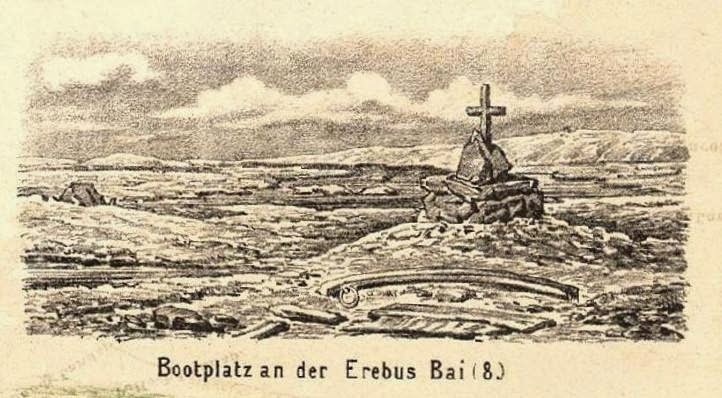 Today, the story is a bit different: most Franklin experts, myself and Dave Woodman among them, regard the Erebus Bay site as one which was used for some time, and near which which one or both of Franklin's ships were, for a time, anchored. The period of longer use would explain some of the items the Inuit found there, including heavy metal stoves that would not likely have been dragged overland all the way from Crozier's landing; it would also explain the presence of a boat, not then in use for escape but rather for conveying items to or from a ship not far distant, the contents of which would of course not represent what the men would have laden it with had they anticipated a long journey. And the "boat place" itself is becoming more uncertain. Hobson and McClintock found only one boat, with two bodies -- both, it should be noted, missing their crania. Hobson also saw, on examining one body, that the small bones of the hands and feet had been left behind in the gloves and socks. There was a rifle and some shot, and one body was wrapped, or rather seated in, a heap of furs. Six paddles; many table-knives, white handles; one watch; a spyglass ... something like my (Hall’s) compass, but no glass about it; tobacco that had been wet and was in flakes or thin pieces; very many tin dishes; one whole skeleton with clothes on, —the flesh all on, but dried; many skeleton bones; three skulls. Alongside of the boat a big pile of skeleton bones that had been broken up for the marrow in them; they were near a fire-place; skulls among these. The number of them ama-su-ad-loo (a great many) — cannot tell how many. It is certain that some of the men lived on human flesh, for alongside of the boat were some large boots with cooked human flesh in them. In addition to many items -- a spy-glass, table-knives, and a compass (all of which, had this boat been the one Hobson and McClintock found, would surely have been taken by them), there are many human remains here, not only in the boat but beside it, and many skulls. Clearly, this was a different boat entirely; it may well have been hidden in the snow back in 1859. Recently, a study -- not yet available to non-subscribers -- appeared in ARCTIC, written by Anne Keenleyside (one of the first archaeologists to study human remains from this area), Doug Stenton, and Robert Park. They studied the site of a memorial, erected in 1879 by Frederick Schwatka, at what he believed to be "the" boat place. The memorial (see above) had long been taken down, but the packet of bones Schwatka had reburied was still there and in its original arrangement: a squareish cavity with the longer bones stacked side by side, topped with a human cranium like a cherry on some macabre sundae. Their study shows clear evidence that this is indeed Schwatka's memorial. They found the remains of three individuals, all male and Caucasian, one of whom was probably quite a young man. There were very few cut marks on them, although one bone showed a curious small oval hole, as though it had been punctured by a somewhat blunt pointed instrument. The small bones of the feet and hands were largely missing. Their study speculates that these may indeed be the bodies from Hobson's boat -- the missing small bones correspond with this, and one of the skeletons was, just as Hobson had noted, unusually large. The small hole might have been made long after their deaths, as a pick-axe was required back in 1859 to free up the bodies from their frozen surroundings. I think that's quite possibly true, although one would still have to account for the three crania (Hobson's boat itself having zero), and indeed a third body not previously reported. Which means that In-nook-poo-zhee-jook's boat was not this boat. The Schwatka site, tagged NgLj-3, is not very far from NgLj-2, which is on a small, low-lying island surrounded by mud. There, the great abundance of remains, already catalogued back in the 1990's by Margaret Bertulli and Anne Keenleyside, corresponds more closely with a "pile" of bones, skulls among them. The article, however, makes no mention of any other boat place. It's just one example of the kind of uncertainty which the Franklin search on land faces, with studies all done nearly a century and a half or more after the initial events. Still, it shows how the close, careful work of archaeologists is absolutely vital if we're going to put together the incomplete pieces of this mighty puzzle. Fascinating stuff, Russell! As to the missing skulls, it is known that the acts of cannibalism included breaking open the cavities of skulls to access brain matter (see "Brains for Dinner" post, May 1, 2013). It therefore seems possible that the heads of the dead were removed, and taken by retreating survivors as a source of "mobile food". Hi Glenn, yes, that's quite likely (see my earlier post Brains for DInner). But the skulls from the Schwatka reburial all seem to be intact. I believe that Keenleyside and Stenton are seeking to do facial reconstructions using them, as well as trying DNA -- so we may well find out a good deal more about these remains, perhaps even their identity! Of course, I wasn't implying that all of the skulls were used/intended as sources of food, just that some of them may have been "mobile food". Facial reconstructions and extracting DNA - promising possibilities, thanks. Understood, of course. One does see fewer skulls that one ought (that is to say, fewer than the # of individuals represented by other bones), so quite possibly some still took their dinner "to go"! A friend of mine, Dr. Dale Russell, a former curator for dinosaurs at the Canadian Museum of Nature, excavated many dinosaur skeletons from solid rock. "It's Russell's Law", he told me once,"you never find the head." There are exceptions of course, but far more often than not it is true for dinosaurs. It might also be true for unburied humans.